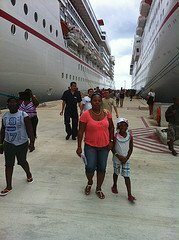 My Carnival Freedom cruise to the western Caribbean was amazing! The ports of call: Key West, FL, Georgetown, Grand Cayman, and Ocho Rios, Jamaica exceeded my expectations. The picturesque views were breathtaking!! I took this cruise with my best friend/sister, Minika, of six years. This was my second Carnival cruise in twelve years! I enjoyed every bit of it, from the beginning to the end. Advice: Bring plenty of spending money! My friend and I left early Sunday morning, on Mother's Day, on a flight to Fort Lauderdale. The city is nice..and hot! We took a taxi to the port, less than 10 minutes away. The fare was $20, which to me is a good deal. Checking in was a breeze. All we had to do was show our passports and board! Before getting on Carnival Freedom, we were given our room key/money card. The card can also be activated as a safe key for the room safety box. (Guard it with your life!). Mine was red - I am a Very Important Fun Person (VIFP) rewards member, and my friend's card was blue (first timer). When we got to our room, an interior cabin without a window, our luggage was at the door. The Carnival Freedom boat is majestic. My favorite areas are the spa, lido pool deck, and the casino. My favorite events of the trip were climbing Dunn's River Falls in Jamaica and swimming with the stingrays in Grand Cayman. I loved laying out on the white sandy beaches. The fun days at sea were enjoyable. There was always something to do. I loved that there was an itinerary for each day. I sunbathed and my bestie and I soaked in the hot-tub and watched movies on the big projector screen on the first night and final night of the cruise. I enjoyed the Chic Dining Room, which served delicious three course meals. The staff was very nice and went above and beyond for the guests. My favorite waiter was Igor from the UK. He was so nice and a gentleman. On the last night of the cruise, I gave him and another waitress from the Phillipines, a tip as a token of my appreciation. He gave me a hug and I took a picture with him. In all, I had a great time - a fantastic Carnival Freedom cruise. I would do it all over again! I also just got off the Freedom and met Igor from Ukraine, my 8 yr old has a serious crush on him. Curious if this is the same Igor..